With the 2018 NBA draft class almost set, it’s time to take an early look at what the 2019 talent pool could look like, headlined by three future Duke stars in the top four of our Big Board. It goes without saying that there’s a long, long way to go until next year’s draft. But with this year’s talent pool beginning to crystallize and the 2018 draft exactly six weeks away, it’s not too early to put some real thought into it. The picture is of course far from complete, as there are still a couple dozen immediately draft-relevant and eligible underclassmen who have not hired agents and can return to school (see the Front Office’s Top 100 list for full reference). Some of them have been included on this list but some notable ones have not, based on conversations with executives and scouts around the league who are now fully ingrained in the pre-draft process. The key omissions from this initial top 30 are as follows. As we reported last week, league sources widely expect Missouri’s Jontay Porter to sign with an agent and forgo his sophomore season for the NBA. The consensus belief at this stage is also that Villanova’s Donte DiVincenzo is leaning toward entering the draft, given his stock may never get higher after a strong performance in the NCAA title game. Both players are likely to find themselves among the first 40 picks. Also left off based on our projections are Maryland’s Bruno Fernando, Creighton’s Khyri Thomas, Cincinnati’s Jacob Evans and Syracuse’s Tyus Battle, all of whom could be top 40 selections if they stay in this draft. [Update: Evans will sign with an agent.] Draft-eligible underclassmen who narrowly missed the cut here include Iowa State’s Lindell Wigginton, Boston College’s Ky Bowman and UCLA’s Jaylen Hands, all of whom are facing decisions in the coming weeks. Another wild-card aspect of next year’s draft is the possibility of high school seniors-to-be who turn 19 during the 2019 calendar year opting to reclassify, graduate early and take the Marvin Bagley route into an accelerated eligibility situation. NBA types and high school talent evaluators alike are considerably down on the talent level of next year’s class, and there are a number of top high schoolers who could make the jump should they choose to skip a year of high school. Based on conversations with NBA front office personnel and our own in-person evaluations, you’ll find a first look at the 2019 draft below. As the early-entry deadline comes and goes, we’ll update this list accordingly. You’ll find our latest 2018 mock draft here. 1. 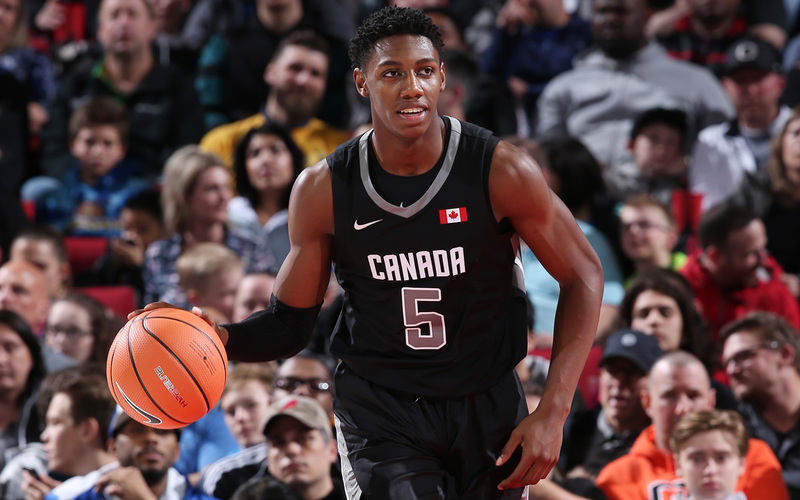 R.J. Barrett, G/F, Duke | HS Sr.
As it stands, Barrett is on track to follow Andrew Wiggins and Anthony Bennett as the third Canadian-born No. 1 pick in the last seven drafts. An athletic, slashing wing, Barrett’s ability to get to the basket and create off the dribble coupled with the consistency of his play has earned him the top spot coming out of high school. He’ll eventually have to address NBA teams’ concerns about his jump shot. Watching Barrett, Cam Reddish and Zion Williamson share one ball at Duke this fall will be fascinating. 2. Cameron Reddish, G/F, Duke | HS Sr.
Reddish is as talented as anyone in next year’s class (if not more), capable of running the point or playing off the ball and possesses a natural blend of size and strength. He has high-end ability to change speeds and generate space off the dribble, and sees the floor at a high enough level to play point guard at times. It’s early but NBA scouts have concerns about his approach to the game, which is frequently passive. If Duke can get the most out of Reddish the results could be scary, but he can’t be content to sit back and coast. 3. Nassir Little, SF, North Carolina | HS Sr.
An explosive, bucket-getting wing, Little helped himself this spring with strong showings in practice at the McDonald’s All-American and Jordan Brand games. Already mature physically, Little has a relentless mentality on both ends of the floor and can be a disruptive on-ball defender with his 7'1" wingspan. He seems to be improving as a jump shooter, and the next step is improving his shot selection and handle. He’s trending upward on the NBA radar going into next season, and should be showcased at UNC. 4. Zion Williamson, F, Duke | HS Sr. While Williamson the viral phenomenon tends to precede Williamson the prospect, the latter is actually far more interesting to consider. Of course, he’s a freak athlete in every sense of the word, capable of aerial feats that bely his hefty build. There aren’t many useful comparions here. Williamson also has a good deal of skill and feel, preferring to play with the ball in his hands so he can facilitate and score. Exactly how he fits into Duke’s puzzle will be an interesting indicator of where his draft stock trends—some scouts believe his future lies as a small-ball big. His jump shot is his Achilles’ heel, and will determine a lot. Doumboya was the most impressive prospect at February’s Basketball Without Borders Global Camp in Los Angeles, and appears ticketed for an early selection in 2019, though his professional season in France will play a large factor in where he ends up. Both talent-wise and athletically, he’s right up there with his American peers. With a strong body, 6'11" wingspan and huge hands, Doumboya has a rare power-skill combination on the offensive end, and can be a standout defender when fully engaged. He’s a confident jump shooter and should be capable of playing either forward spot as he matures. Improving his handle is the next step. 6. Romeo Langford, SG, Indiana | HS Sr.
After appeasing his entire home state with his college committment, Langford heads to Indiana with serious hype, and has a well-rounded skill set that projects nicely to the pros. He’s a smooth player with a protoypical build for a shooting guard, and is already comfortable creating shots off the dribble. Langford doesn’t have a glaring weakness at this stage, but will need to keep developing his craft to become a star—he’s a good but not elite athlete, and a capable but not great three-point shooter. He has a natural feel for scoring that should translate to big freshman-year numbers and a substantial NBA career. 7. Quentin Grimes, G, Kansas | HS Sr. Checking all the key boxes for a combo guard, Grimes should be a big part of Kansas’s backcourt puzzle next season. His mix of positional size, ball-handling ability, passing feel and three-point shooting adds up to a solid, fundamental game. He has impressive coordination for his size and finishes pretty well around the rim. Based on both McDonald’s and Jordan Brand weeks, Grimes could be more aggressive defending and imposing his will on the game in all facets, and appears to need the ball in his hands to thrive right now. If he rises to the occasion at Kansas, the draft lottery should be within reach. Gafford opted to stay at Arkansas rather than enter the 2018 draft, which could wind up being a shrewd move for two reasons: the number of available bigs in the first round, and a thinner-looking 2019 class all-around. He put together an impressive freshman season after coming in off the radar (18.8 points, 9.8 rebounds, 3.5 blocks per-36), and profiles as a mobile rim-runner and shot-blocker. Gafford will need to keep improving his skills as a finisher, free-throw shooter and defender, but is trending toward being a lottery pick. Some around the league speculated Hachimura may have had a chance to sneak into the back end of the 2018 lottery had he stayed in the draft. Instead, he’ll return to a loaded Gonzaga team that should have a strong shot at the Final Four. A powerful athlete and finisher who should be able to play both forward spots, Hachimura has clear NBA-caliber tools even though he's still raw in several areas. He stands to refine his game off the dribble, and NBA teams will be looking for him to take a step forward as a shooter (he has a capable mid-range game and shot 79% from the line, but made just five of 26 three-point attempts this season). Hunter is another player who would likely have been a first-round pick in the 2018 draft, but opted to return to school. Defensive versatility is the hallmark of his game, as he’s capable of guarding 1–4 and has outstanding hands and instincts. 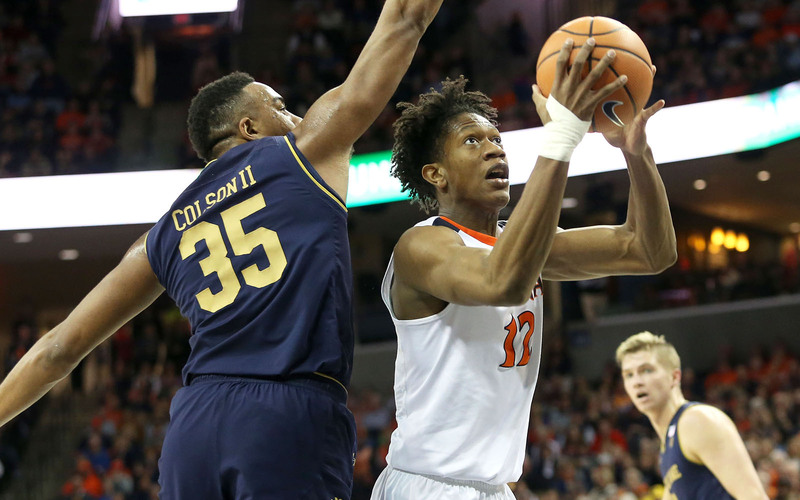 Hunter also looks comfortable handling the ball and has shown some ability to create his own shot within a limited role in Virginia’s more rigid offensive system. How the Cavaliers decide to optimize his skills next season could have a direct impact on his draft slot. Here’s hoping they decide to turn him loose. Samanic’s play was up and down at Basketball Without Borders camp, but his overall skill set and strengths are highly appealing in the long-term. Should he enter the draft next year, a first-round slot will be within reach. He’s not a stiff athleticially and boasts the skill level to spend time at all five positions, though he’s most likely to end up as a combo forward at the next level with his ability to handle and shoot. Samanic has yet to log high-level minutes as a pro and finding consistent playing time is the next logical step, but he’s put himself in good position for now relative to next year’s draft. 12. Keldon Johnson, G/F, Kentucky | HS Sr.
Perhaps the most impressive player over the course of McDonald’s All-American week, Johnson is extremely competitive and can be a bully scoring the ball on the wing. While he benefits from being physically mature, he has a polished offensive game at this stage. He's able to finish above the rim with either hand, hit the three with some consistency and fall back on his midrange jumper if need be. He should have immediate success at Kentucky and potentially parlay that into a one-and-done year, but he may lack the elite upside of some others in this class given he relies more on strength than explosiveness. 13. Darius Garland, PG, Vanderbilt | HS Sr.
A twitchy athlete with ideal tools to run the point, Garland has a fluid game off the bounce and profiles as one of the more intriguing long-term playmakers for 2019. He sees the floor well and appears more of a drive-and-kick downhill passer than a natural setup man. 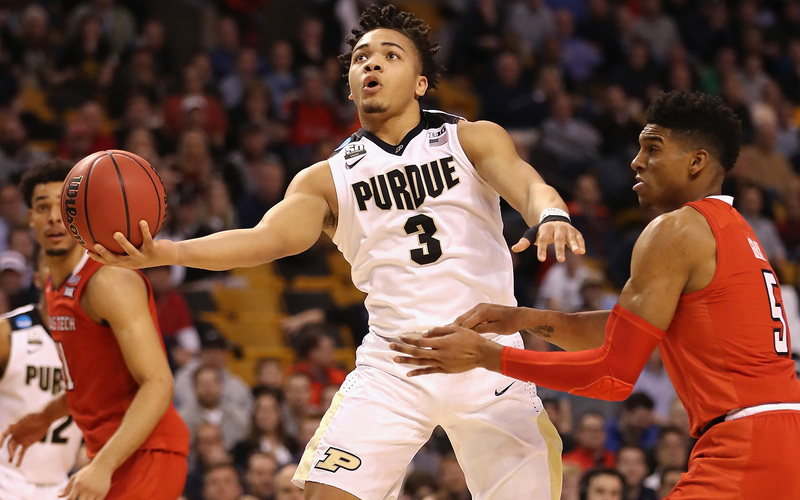 Garland can shoot from outside and has a natural knack for putting the ball in the basket, but will need to get stronger in order to hold his own defensively and to better finish in the paint. If he has trouble adding muscle, he’ll have to improve his skill level in other areas to split the difference. 14. Louis King, F, Oregon | HS Sr.
King tore his meniscus in January and had to sit out the All-Star circuit in the spring, but is expected to be a big part of Oregon’s team next season. An offensive-minded wing with a reliable jump shot, King has a bit of a reputation for inconsistent play, but substantial talent. He may wind up as a combo forward as his body continues to fill out. He’s smooth and coordinated but not an elite run-jump guy, and continuing to polish his scoring and showing more committment to defense and rebounding will help. King has theoretical versatility, but is still figuring out how to harness it. 15. Bol Bol, C, Oregon | HS Sr. The son of the late Manute Bol is one of the more unique players you’ll find, but also comes with his fair share of questionmarks. Bol is highly coordinated for his extremely tall body, with a 7'9" wingspan and 9'6" standing reach that naturally create some problems on the defensive end. He can catch lobs and dunk from places others can’t. But NBA teams have serious questions about his desire and willingness to win and improve, not to mention what aspects of his game actually translate. He also may not be able to get much stronger, and may have issues with the low release on his jumper. Bol has a crucial year ahead of him. Presently testing the waters, Huerter appears a good candidate to return to school after the combine and try and play his way into the first round in 2019. He’s a well-rounded offensive player and natural three-point shooter (41% last season) with the ability to handle the ball and playmake a bit off the dribble. There’s a lot to like about his game, and while he may not wind up being a star, at minimum he should wind up playing in the NBA a long time as a specialist. Okogie has also entered the 2018 draft without an agent, but says he hasn’t made up his mind yet. If he returns to Georgia Tech and continues to diversify his game, he should have the inside track on a first-round selection next year. Okogie has the body and game to become an athletic 3-and-D support player but hasn’t completely refined his approach yet. He needs to prove he can rein in his shot selection and play efficiently while still producing at a high level if he goes back. If he does, he stands to improve on his draft slot. Although Wilkes is more of a 3-and-D player in theory right now, his athleticism and potential as a jump shooter should put him in the first-round conversation next season if he returns to school. He should be able to add muscle to his lanky frame and potentially evolve into a combo forward. Wilkes struggles to create off the dribble and will have to become a much better ball-handler to play as a true wing. If he shows improvement as a scorer and establishes himself more defensively as a sophomore, he’ll do himself a favor when it comes to draft position. Washington was at his best playing as a small-ball five this season, with freakish length that helps compensate for his lack of height. He’s presently testing the waters along with teammates Jarred Vanderbilt and Wenyen Gabriel, creating a bit of a quandary as far as playing time for whoever returns. Washington will have a chance to solidify his stock at the combine, but seems more likely to land in the early second round than the first, which could lead to another year of school. He doesn’t have crazy upside, but his skill level on the interior and explosiveness off the floor could make him a quality role player. One of this year’s bigger combine snubs was Edwards, who put together a big sophomore year (18.5 ppg) and solidified himself as a legit prospect. He’s probably best served returning to school at this point, given he’ll have a good platform to improve his playmaking skills. Edwards is a big-time shot-maker who can hit deep threes and plays with an nice level of calm and confidence. He’ll be one of the best point guards in college hoops as well as one of the better guard prospects if he goes back. While Jones was very much a work in progress this season, he should be a fascinating player to track over the next year. With the NBA’s premium on versatile forwards, his potential to defend four positions is noteworthy. That said, he has a long way to go when it comes to learning how to play. He flashed bits and piece of skill as a freshman but struggled to score efficiently in any facet of the game. In his defense, Jones had never really played against high-level competition before arriving at Alabama, and should take a step forward as a sophomore. 22. Simi Shittu, F, Vanderbilt | HS Sr.
Shittu tore his ACL in January and missed the brunt of his senior year at Vermont Academy, but is said to be ahead of schedule in his recovery and is currently expected to be ready for the start of college season. The Canadian-born hybrid forward has a smooth, versatile game and an ideal body for the NBA level that’s already relatively mature. He’s still refining his perimeter skills and his jumper, and could end up as more of a small-ball big in the pros. Time is certainly on Shittu’s side as it pertains to his long-term development. 23. Darius Bazley, F, NBA G League | HS Sr. Already a national topic of discussion after opting to forgo a year at Syracuse to jump to the G League, Bazley’s status is a bit volatile at this point in time. He showed some promise on the All-Star game circuit, where we got an initial look at him, and as a versatile perimeter defender with size, could definitely do well for himself if he adjusts well to life as a pro. However, his raw offensive game is an overall questionmark right now in most facets, and Bazley’s handle and jump shooting development will be the key areas to watch. The expectation around the league seems to be that Donte DiVincenzo will turn pro now, and so Spellman is actually the more compelling candidate to return and move up for the 2019 draft. His complete reworking of his body paid off big-time, and he looked visibly more comfortable on the floor as the season went on. Spellman is deceptively skilled and a legitimate shooter, making 43.3% of his threes. He's also more athletic than his thick build would suggest. He’ll be more of an offensive fixture next year, and if he stays in shape and continues to rebound the ball at a high clip, he could end up in the late first-round mix. Foster announced he will return to SMU for his senior year, a decision that most around the league expected given his recovery from an ACL tear left him unable to work out for teams. Had he stayed healthy, Foster would have likely fallen somewhere within the first 40 picks of this year’s draft. He’s a terrific athlete, versatile defender and ideal role player for the next level, with a high IQ on both ends of the floor. Improving his three-point shooting and expanding his scoring profile with Shake Milton out the door are on the docket for him this off-season. Zhaire Smith wasn’t the only Red Raider who arrived on the NBA map this season. A long, athletic wing scorer who operated primarily as a spot-up threat, Culver boasts a terrific physical profile for an NBA two-guard and is a guy who passes the eye test. He made 38.2% of his threes this year and is very comfortable shooting off the catch and attacking closeouts. Culver is smooth but not extremely explosive turning the corner, and has to improve his ball-handling in order to generate more of his own offense. If he becomes a more consistent shooter and defender, he’ll have some definite value. 27. Nazreon Reid, C, LSU | HS Sr. While Reid has more of an old-school body, his versatile offensive skill set makes him an intriguing name to follow into next season, though he’s far from a safe bet right now. He’s extremely skilled for his size, capable of shooting the three, posting up and potentially shouldering some sets as a passer on the block. Expect him to be featured at LSU. Like many young big men, Reid will need to shake his reputation for occasionally dogging it effort-wise. His heavy build may also cause some issues in terms of defensive mobility. If his offensive positives can outweigh the other factors, he should have a chance at going one-and-done. Gonzaga will be as heavily scouted as any team on the West Coast this fall, and Tillie—after making 47% of his threes this season—stands to benefit. There is concern about his slight body type and ability to bang inside, but the Frenchman is highly skilled and a more athletic leaper than you think. With his size and shooting stroke he‘ll have a definite opportunity to succeed in the pros. Next season will be about rounding out his game, making a more consistent scoring impact, and convincing scouts he’ll be able to defend enough to make it. 29. Jalen Smith, C, Maryland | HS Sr.
A stretch big who goes by the nickname “Sticks,” Smith was able to showcase his legitimate three-point shooting skills in front of NBA personnel this spring. As that name would suggest, he needs to bulk up. But if Bruno Fernando heads for the draft, Smith will be thrust into a major role right away. He’s a competitive, skilled scorer who has enough foot speed to succeed at the next level. Smith is built more like a four than a five and until he gets stronger, it’s hard to see him being an impact defender. But he appears to be improving quickly and is still figuring out what type of player he’s going to be. 30. Luguentz Dort, SG, Arizona State | HS Sr.
Hailing from Montreal, Dort will be in position to make an immediate impact at Arizona State and is the type of big-bodied guard NBA teams value. He’s built similarly to Marcus Smart, bringing a physical style of play and preferring to use his strength to attack the rim. He may already be at peak physical potential, so refining his skill set—particularly a three-point shot NBA scouts have called into question—and figuring out what his role should be are the keys for next season. Dort could become an impact defender and useful utility guy in the backcourt if things break in his favor.